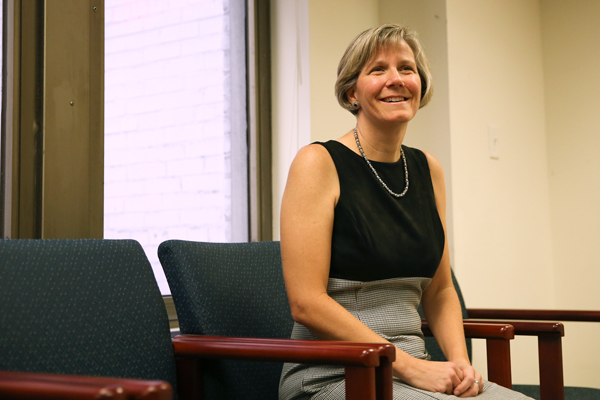 Laurie Koehler, the vice provost for enrollment management and retention, said admissions officers will ensure campus is welcoming to increase the number of admitted students who choose GW. To better determine which admitted students will end up attending GW, officials are focusing on campus community. The yield rate, or portion of admitted students who end up attending GW, has dropped from 25.5 percent last year to 24.7 percent for the Class of 2020, meaning fewer admitted students are selecting GW. Laurie Koehler, the vice provost for enrollment management and retention, said a potential student’s decision to attend GW can be affected by their experiences on campus, which means campus should be welcoming and inclusive for students making enrollment decisions. Koehler said national yield is declining annually by about 1 percent as more high school students apply to 10 or more universities, which can make it difficult to predict which schools the students will choose to attend. The applicant pool for the Class of 2020 increased by 28 percent, and about 40 percent of those applicants were accepted. Overall, 2,523 students were enrolled in the freshman class from the more than 10,000 admitted students. GW had the lowest yield rate for the Class of 2020, compared to other D.C. area schools. American University’s yield rate was 34 percent, University of Maryland’s was 33 percent and Georgetown University landed at 59 percent. Other peer institutions had lower yield rates for their freshman classes, like Boston University with a yield rate of 22 percent. Koehler said the easiest way to increase yield is by admitting weaker students, but administrators aren’t willing to consider that option. A positive, welcoming campus can often be the deciding factor for a potential student, Koehler said. One negative interaction on campus – whether it be with a faculty member, current student walking down the street or a parking garage staffer – can move GW down on someone’s list, she said. Getting students, faculty and staff more engaged with prospective students on campus will be a focus for admissions officers this year, Koehler said, though she did not specify ways they will increase engagement. Yield will be even more important to get right next year when determining which students to admit, as the University is currently operating at 99.8 percent capacity in terms of the number of full-time students GW is permitted to have on the Foggy Bottom campus at a time. “It is a crazy balancing act. Because of that cap, we are more likely to be conservative in our initial admits, which means using the waitlist to round out the class because we just don’t have room for any error,” Koehler said. In February, University President Steven Knapp spoke at the Metropolitan Washington Council of Governments about the potential benefits to the city economy of lifting the enrollment cap to allow more innovative students to come to GW. Koehler added that while admissions officers are considering the census data for the Class of 2020 and consulting Provost Forrest Maltzman on cap limitations, they have currently not changed their future enrollment goals. While most of the college admissions process is driven by universities, experts said students have the power when it comes to yield. Sara Harberson, a private college counselor and founder of Admissions Revolution, said a university’s yield rate is difficult to predict, as most universities outside of the Ivy League are struggling to keep it up. “You’ve got a lot of highly competitive students who are applying to highly competitive colleges, so the reality fuels the anxiety and they end up applying to more schools than they plan to originally,” she said. Many universities are seeing increased applicant pools because of simplified applications and fewer supplemental essay requirements, but the larger the applicant pool, the more difficult it is to anticipate yield, Harberson said. Harberson added that GW’s slight drop after becoming test optional is neither surprising nor necessarily indicative of a long-term yield trend at the University. Data suggests students who do not submit their scores do just as well or better than those who do, she said. If students are doing well at GW after a few years of using the test-optional policy, that should be reflected in the future yield rate, Harberson said. Andrew Belasco, the CEO of College Transitions, a college consulting company, said with the easy accessibility of tools like the Common App, students looking for urban institutions like GW are now more likely to also send applications to peer schools like New York University. While decreasing yield is a national trend, it is most pronounced at expensive universities with high tuitions that cannot necessarily rely on reputation, brand and affordability, Belasco said. GW’s cost of attendance, which includes room and board, tuition and books, is approximately $68,275, and the net price, or average cost for students including factors like financial aid, is about $34,543. “Admissions and financial aid offices should think carefully about how they present costs and financial aid information, so students have a clear understanding about their ability to enroll,” Belasco said. This article appeared in the December 5, 2016 issue of the Hatchet.